Ever since the discovery of the gorilla by the Carthaginians, five centuries before Christ, there has remained a never-dying interest in the men who most resembled monkeys and the monkeys who most resembled men. From the capture. of Carthage, 146 years B.C., when in the temple of Astarte, as stated by Pliny, the taxidermed pelts of two female gorillas were found, up to the present day, when the scientist is preparing a work on monkey etymology, syntax and prosody, we have sought in all ages to pierce the thin veil which has separated the anthropoid ape from the juror and the intelligent voter. At the present moment so earnest is the scientist that every possible aid should be offered him in his efforts to solve this mystery. While one in the extreme and frozen north is discovering depraved humanity, so savage and so brutal as to mix up socially with those animals who are not too haughty, another is allowing himself to be put in a steel cage in the heart of the tropical forest, with a phonograph, studying the different dialects of the gorilla. This man shows more fully than any other the pure, earnest devotion which we admire so much in the true scientist and lover of progress. 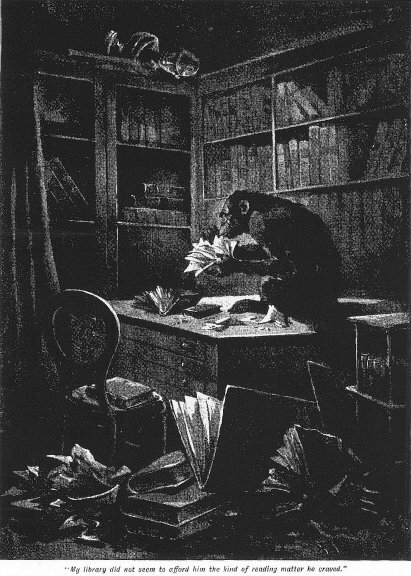 Noticing that the gorilla, though quite abundant where his cage was placed, seemed to hesitate about approaching, a bright idea occurred to him — namely, that his clothing prevented that perfect resemblance which he wished should be impressed upon them, in order that they might yield him their confidence and a few weeks' pleasing conversation. Thereupon he removed his clothes and placed them outside the cage. Smiling with that dental smile peculiar to the anthropoid ape, and romping about his cage with a ripple of gorilla laughter, he waited for the services at the gorilla Sabbath School to be over, in order to watch the congregation go by. The superintendent, apparently, after the school was dismissed, was first to see the scientist, and deftly calling the attention of the others to a magnificent sunset on the other side of the road, he got them safely out of sight, and then returned to the cage. Harsh words were exchanged between the two; but, as a novice always learns first the profanity of a new language, the savant met the mild remarks of the superintendent with the most blood-curdling oaths. It is only recently, in fact, that the professor has discovered that the whole of his gorilla vocabulary had been so far acquired at the Five Points on the Bowery of the gorilla kingdom. Finding that a new kind of anthropoid had built himself a bamboo coop by the roadside with the idea of hurling profanity at the Bible-class, the gorilla superintendent went through the professor's pockets, put on his clothes, then, glancing hastily at the gold watch, and noting that it was past his dinner-time, he raised his hat to the surprised professor and hastened away, examining the professor's nice new revolver as he went. I could tell much more of the heretofore unwritten history of the effort to obtain a social footing among the gorilla set, but space forbids. In 1589 an English sailor, who was detained in Western Africa, discovered two varieties of anthropoid ape, which reminded him of the early Saxons, except that they were more temperate. These he described as resembling what we now call the chimpanzee and the gorilla. The latter was called pongo by the natives, and had a low, retreating forehead, like the codfish, or the sovereign voter of New York. By the sovereign voter, of course I mean the man who is opposed to any sovereign that is not in his inside pocket. This sailor described the pongo as rather plain in features, and, like the tailor-made girl, tallest when he sat down. "The legs of the pongo," says the report, "are very short, and have no calves, or, if they have, they are apt to be in front of the leg, like those of the chorus in the antique ballet." Believing, as I do, that every one who has the slightest ray of light to throw upon this great movement in science, this effort to acquire the monkey language and make it part of the curriculum in our schools, so that the rising generation may not stand abashed in the presence of the chimpanzee, I have thought best to offer here a brief account of my own researches in that line some years ago. In 1848, as spring approached, a warm personal friend and former schoolmate of my uncle Sidney had the misfortune to kill a man by means of an iron dray pin, which produced a stellated fracture of the frontal bone. The deceased, it is thought, would have survived if my uncle had been more prompt in securing a chirurgeon, who might have lifted the fractured bone from the brain and prevented the hæmorrhage, which proved fatal. My uncle's personal friend and former schoolmate, however, was absent so long looking for a doctor that the man died and had been buried over forty years when the former returned. The travels of my uncle's personal friend and former schoolmate had brought him in contact with all sorts of men and climes; and on his return, three years ago, he gave me a youthful chimpanzee, named Phelim O'Mussle. Phelim was quiet for a week or so, and at night seemed cursed with insomnia. The chimpanzee at home runs about a good deal of nights, and it is hard for him to adjust himself to other hours. Phelim found it especially dull, as my library did not seem to afford him the kind of reading matter he craved. Just between the gloaming and the shank of the evening Phelim would stroll forth under the persimmon trees that cast their quivering shadows over the fragrant blue grass turf. Phelim wore a heavy head of bright red throat-whiskers, which looked like a torchlight procession down his chest, and were parted in the middle as far as the pit of his stomach. With his hands behind him and his head bowed forward, he would walk sometimes till midnight, thinking, as I afterwards learned, of the future of his people and reciprocity between them and other nations. I finally got so that I could not bear to see Phelim suffer so, and began to study his language, at first only hoping to acquire some of his proper names and a little profanity, so that we could be on easier terms; but after awhile I got to adding prepositions and conjunctions. Soon I became an enthusiast, and learned even to note the inflections of his voice. Long before that he had learned to know when I was sad, or even thoughtful. He could tell when I was bored, and could make a bore so unhappy that he would go away rather than feel Phelim's cold nose up his cuff or down his collar. Soon I began to learn Phelim's language, so that I could parse whole sentences or decline some of his verbs with thanks. I am a good imitator, and soon got to using figures of speech, and could tell dialect stories to him in his own tongue; and I can truly say that he was equal to the occasion, for he told me many amusing anecdotes, especially of explorers who had been in Africa and who had killed so many niggers that they began to look upon themselves as great sportsmen, shooting the Africans who could only fight at spear's length, while the explorer had elephant guns, express rifles, and explosive bullets that would strike the unprotected mother, and not only tear her into shreds, but at the same time obliterate the babe in her arms. Phelim was on the ground when one of the foreign slave traders and tusk hunters was trying to escape from a party who wanted to rescue him and write it up for their paper. Phelim said that the horrible look of apprehension on the face of the man, who sought by travel day and night to avoid being rescued and Kodakkered and interviewed, tickled him so, that often he had to get down and wallow in the tall grass and squeal with glee. Phrenologically Phelim was lacking in spirituality, reverence, and ideality; but he was large in alimentiveness, amativeness, love of home, self-esteem and constructiveness. We were good companions, however; and I only feared that in learning his language I was dealing with one who was self-made, perhaps, and who, figuratively speaking, would use such expressions, for instance, at table as, "Please to pass those molasses," or "I seen my duty and I done it." I was anxious to know sometimes whether I had been learning the language and its idioms from an academician or a Congo chump. But I must hurry on. We got so at last that we could trust each other, and I told Phelim many things that I have never told to anyone else. Phelim. and the recording angels and I alone knew these things. Phelim also told me his whole past life, but he was such a self-acting liar that it would be idle to repeat here what he said, and difficult to even freely translate it from the clicks and squeals of which his language was made up. He once recited a poem to me regarding his far¬away home, and it sounded more like the song of a lawn-mower than anything else I can think of. But Phelim was not perfect. He was given on Christmas, a year ago, a fragment of pudding with brandy sauce. The brandy sauce seemed to remind him of something: perhaps it was a club dinner on the Congo years ago; I saw him put his hand to his brow as if in deep thought. We had just been discussing the question of the tariff as a tax and tariff for revenue only. Phelim had held to the last that it was not tariff or no tariff that agitated the businesses and worried the industries of the States, but continued agitation, and consequent anxiety, apprehension and alarm which hurt the universal interests of mankind — a theory which we agreed upon most heartily. Soon, however, he excused himself and left the room, running his fingers through his red throat whiskers thoughtfully. I did not know then that he had a slumbering demon in his breast, or that he had been sent away from Africa by his friends to cure him of this terrible thirst; but it was true. I heard him pacing his room combating the evil spirit in his breast and brain; but when the house was still it seems that he stole to the cook's window and entered it by removing a pane of glass which he had cut out by means of a diamond ring belonging to my wife and handed down to us through the Smiths, who belonged to the Crusaders, and who also offered a large reward for the Holy Grail. Phelim looked through the cook's dress for the pocket containing the key of the store-room, but finding each time that his hand came out at the same place where it had entered, he became so maddened that he picked up an alarm-clock which the cook had in her side pocket for the purpose of wakening her in the morning, and had there not all at once stolen over the sleeping face an expression which reminded him of his sister, Phelim would have brained her. At last, however, he secured the key, and in the morning Phelim was gone. The store-room door was open and everything wet was gone. 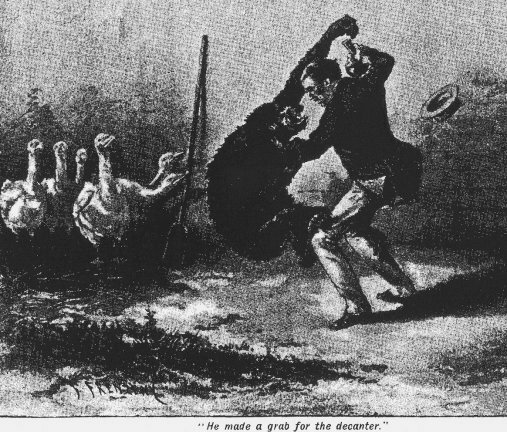 People began to miss their chickens and water melons; the police were informed, but their own pockets were picked while they were hunting for the mysterious thief. This thing went on for three weeks, till one day I looked out at my window and saw in one of the persimmon trees a hand beckoning me. I went out, and found that it belonged to Phelim. He was penitent and out of rum. A little to brace him up, and once more he would lead a respectable and respected life. We went out to the barn. I gave Phelim a tall glass of brandy and soda, and he said now he felt he could squeeze his head through the barn door without injury to the barn. Suddenly, however, he made a grab for the decanter, but I held on fiercely till he took a fillet out of the calf of my leg. This surprised me, and embittered me towards Phelim, so that I strolled up the stairs in an aimless way, hoping to conceal myself in the hay mow. What happened in the hay mow I never knew. Loving friends came and pulled Phelim off and brought me back to consciousness with what he had left in the bottle. Some of my clothes had been torn off in the frolic, but the adhesive plaster on my chest, which had been prescribed for my cough, was still there. Nobody can pull off an adhesive plaster. I caught up a pitchfork as I became more lucid, and Freedom shrieked when Phelim fell. I took him to a Drunkards' Retreat, but the way he made the other drunkards retreat when he got there had a good deal to do with his unpopularity. He also drank up the Eau de Cologne and cod-liver oil that belonged to other patients, and finally, discovering where the superintendent kept his private tank, Phelim entered the laboratory one night, embezzled the whole stock and fled to a deserted lime-kiln, where he drank himself to death after professing religion at a camp-meeting while in a beastly state of intoxication. I found after his death that my knowledge of his language was useless, for three reasons: First, he had a cleft palate and had taught me incorrectly; second, it was proved that before he came to me he had lost his mind; and third, he was the last chimpanzee of the family using that language, all the others having died of an epidemic from which he escaped by being at the time in a Congo's Drunkards' Home. 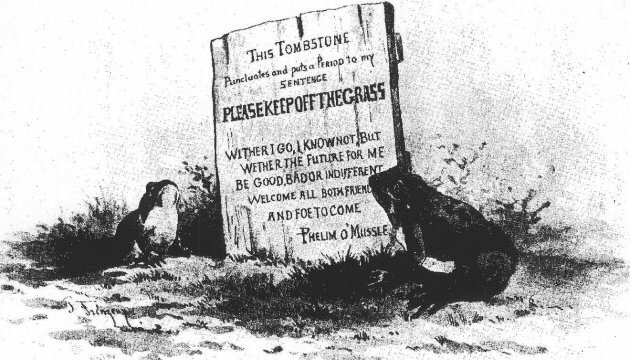 His grave is beneath the persimmon trees, whose freckled shade he loved so well in summer time, and where yet the song-bird wakes the valley in the morning, and through the fragrant dusk of evening we hear the soft voice of the tree-toad calling for rain.